Contractors have been in and out for the last two weeks updating our home with the wonderful improvements that have happened in plumbing and electrical in the last 100 years. We've been demo-ing walls and fixtures to get them ready for the plumbers and electricians to be able to just come in and do their thing. Right now there are 5 rooms in the house that are partially demo-ed -- all three bathrooms, Austin's office and the kitchen. We've been trying to demo little by little and cleaning as we go since, you know, dust and stuff doesn't care that you just got two new velvet chairs. It honestly hasn't been that bad living in the house while all of this is going on. 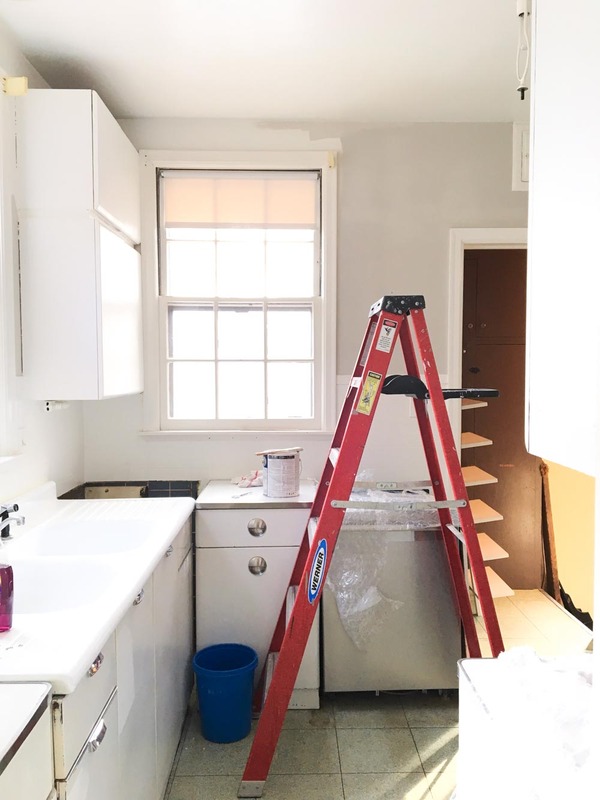 The rooms that aren't getting any structural work are kept picked up and wiped down so that when we're sick of looking at holes in the walls and the ceilings, we can go to the next room and hang out. This last week a lot happened in the kitchen. Austin and a friend reworked the plumbing under the sink, I installed the new faucet and Austin installed a garbage disposal. My step-dad and Austin worked on measuring and cutting new countertops to replace the 1950s metal ones that my mom removed from the cabinet bases. I've been sealing the countertops every day this week with tung oil so that they're sealed but still natural looking. Tonight the plan is to paint the lower cabinets white with my sister-in-laws, Emily and Chelsea. The electricians ran a direct line to the dishwasher and updated the outlets to GFI yesterday. Other than the ugly green floor, I feel like the kitchen could actually be done and ready by the end of this weekend! And by done, I mean palatable for the next 5 to 7 years until we're ready to rip out a wall and do a full-fledged kitchen reno. In 3 weeks, so much has already come together thanks to our amazing family members and contractors that have done so much for us. Having people in and out has made me keep up with cleaning in a house that can never really be clean at this point and has helped motivate us when we'd love to take an evening off from home things but know we have helpers coming. The progress is so satisfying and it's only going to get better.